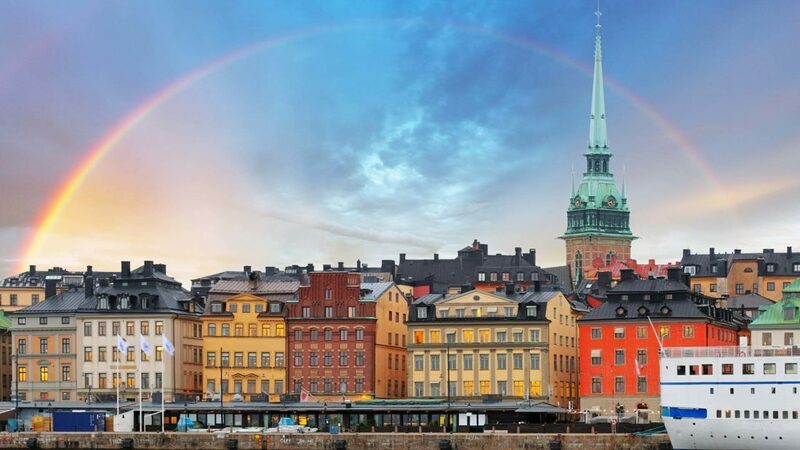 One snowy morning in early March, I had the amazing opportunity to experience my first pride parade in Sweden. Waking up early in Umeå, I brewed my coffee, bought some surprisingly good fika from the local circle K (who knew that all Swedish gas stations have amazing cinnamon rolls!? ), and hit the road. My friend and I drove north, arriving in the university city of Luleå about four hours later. 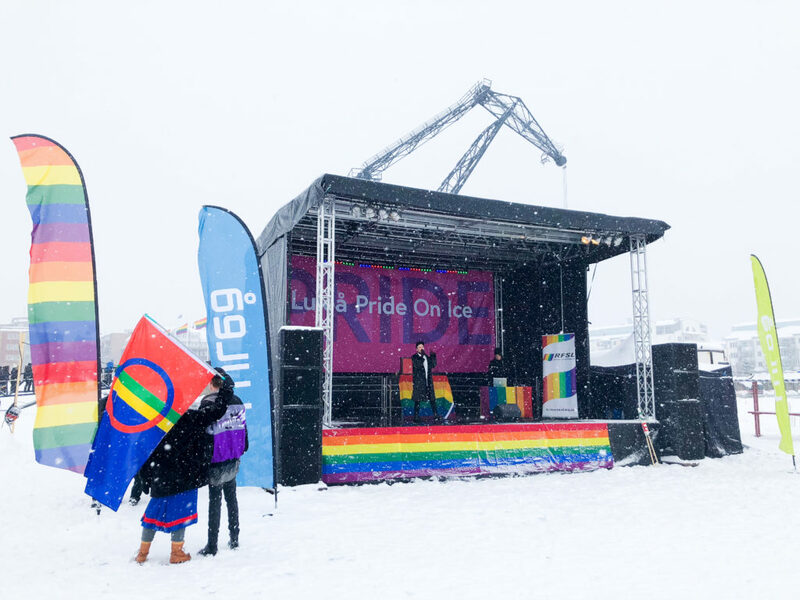 By the time we arrived, there was heavy snow falling, and we skidded our way to the parking lot of Luleå Pride on Ice. 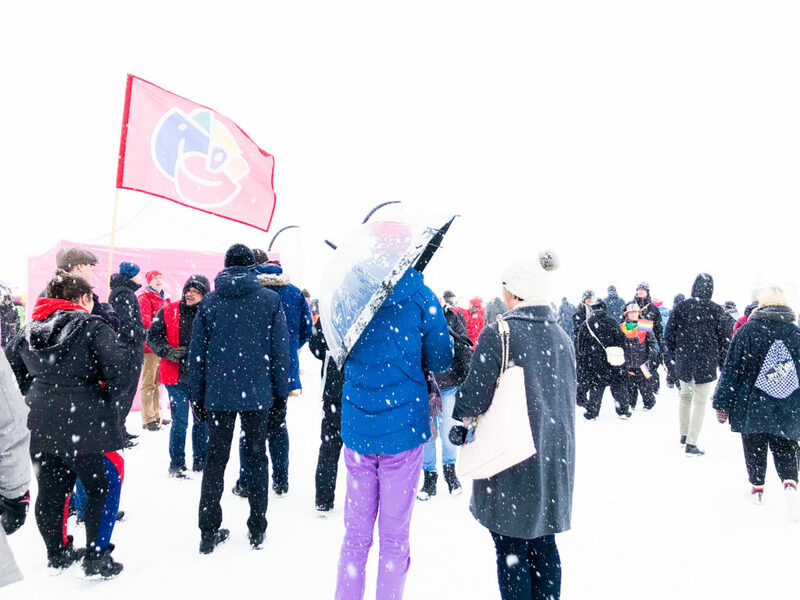 Drawing nearer, we could see a large RFSL flag waving through the whiteness of the snow storm, marking the central convening area for the parade. 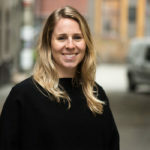 The RFSL is a large organization founded in 1950, dedicated to supporting and promoting the rights of the LGBTQ (sometimes hbtq, in Swedish) community and beyond. 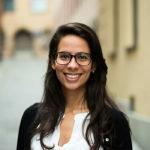 They have thirty local branches, and over 6000 members across Sweden. 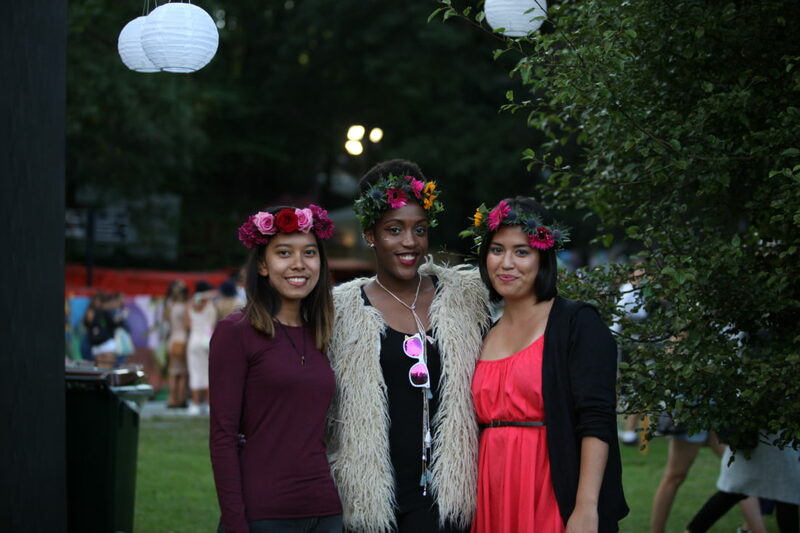 Check out the RFSL website for more information on their dedicated work and activism. 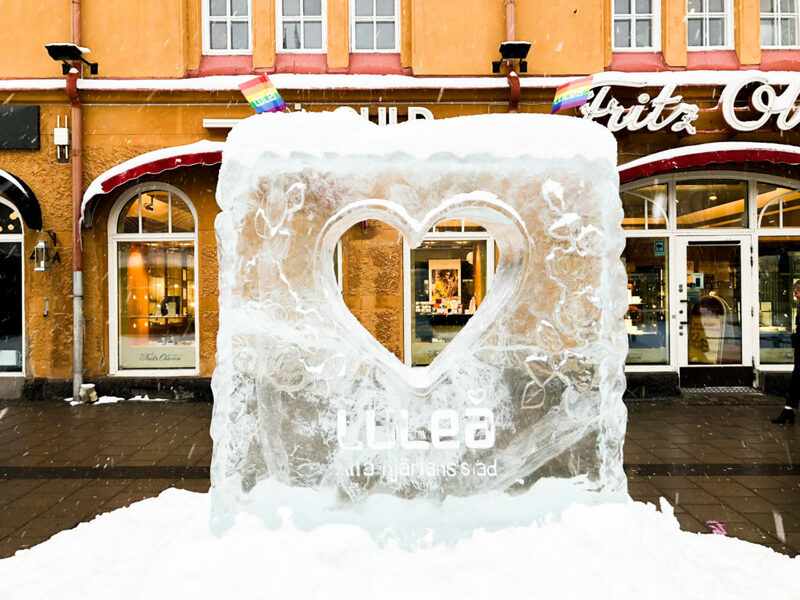 This first year of Luleå Pride on Ice is a collaborative effort of RFSL Luleå and Northern Norrbotten County. 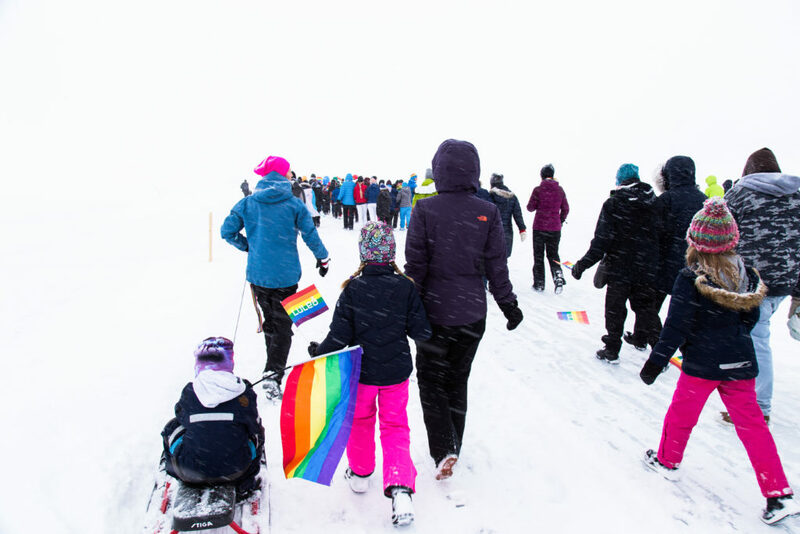 Apparently however, this unique snowy parade out onto the ice is actually a sister event to an older Pride march held during the summer months in Luleå. 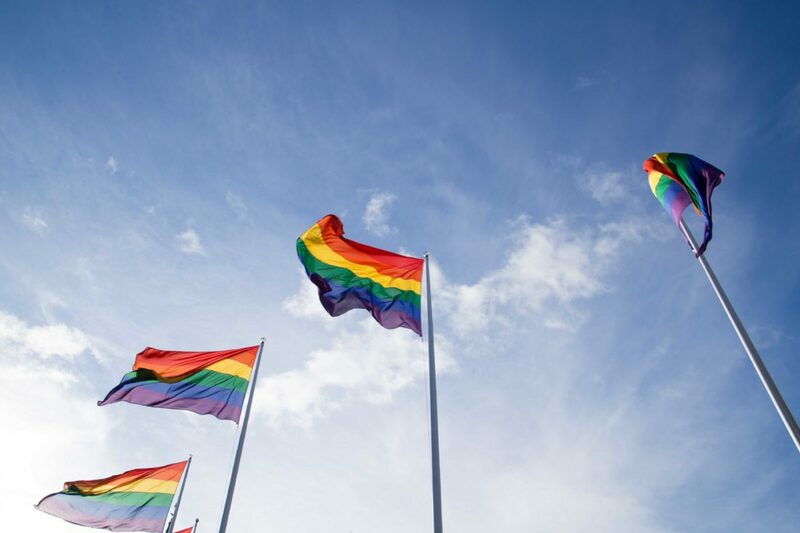 In the past, I had attended various Pride walks and festivals, set on big city streets, and with sunny bright blue skies overhead. 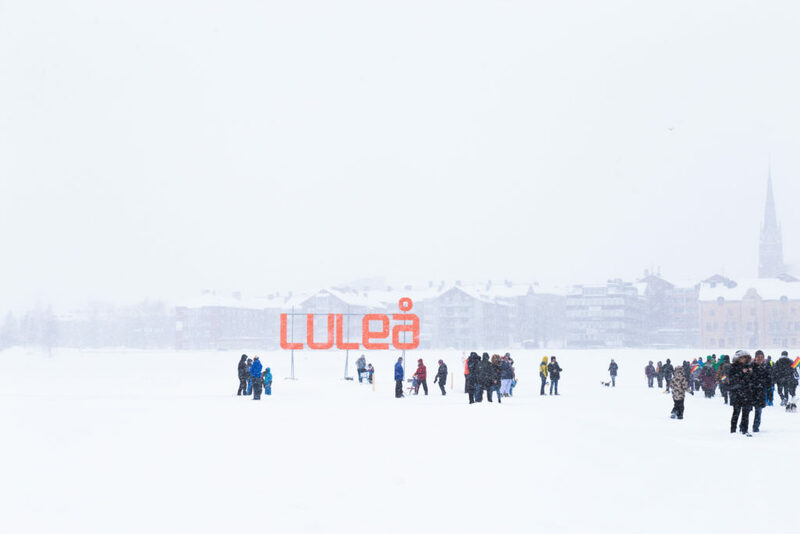 In Luleå however, it was apparent that things were not going to be as such. 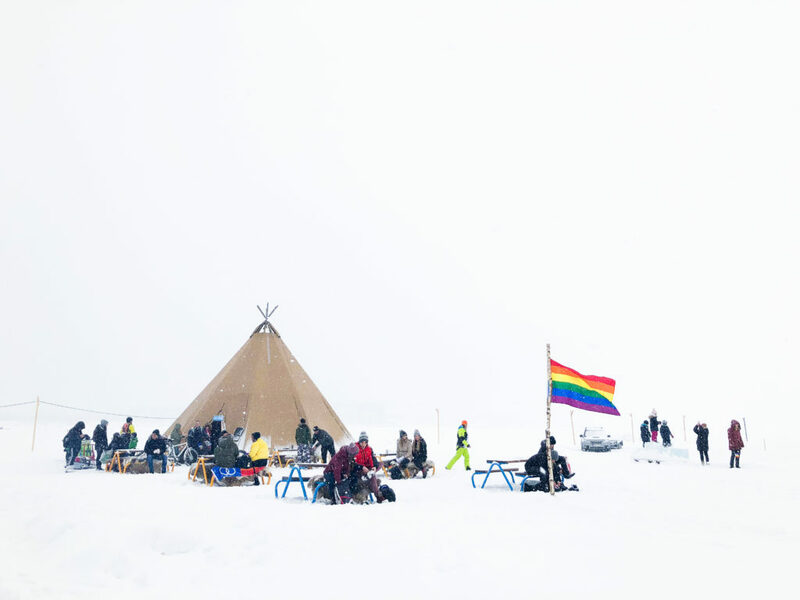 This Pride was actually located on the ice of the frozen inlet of Södre Hamn. 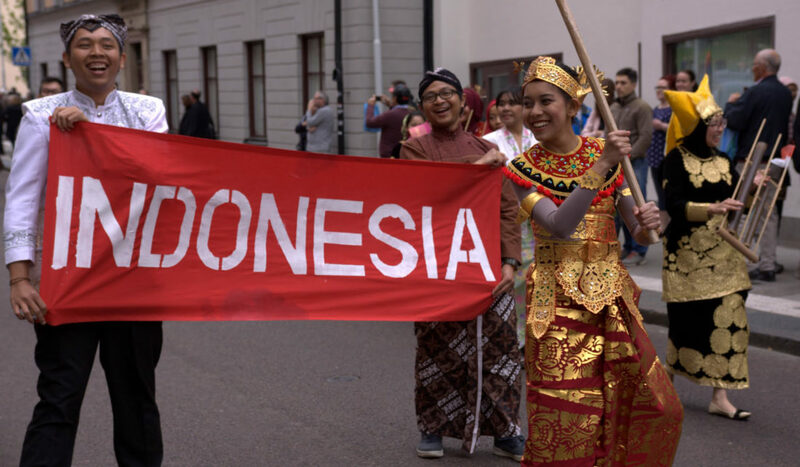 This unique setting should not have surprised me, as it was advertised as the most northern Pride Parade in all of Europe! 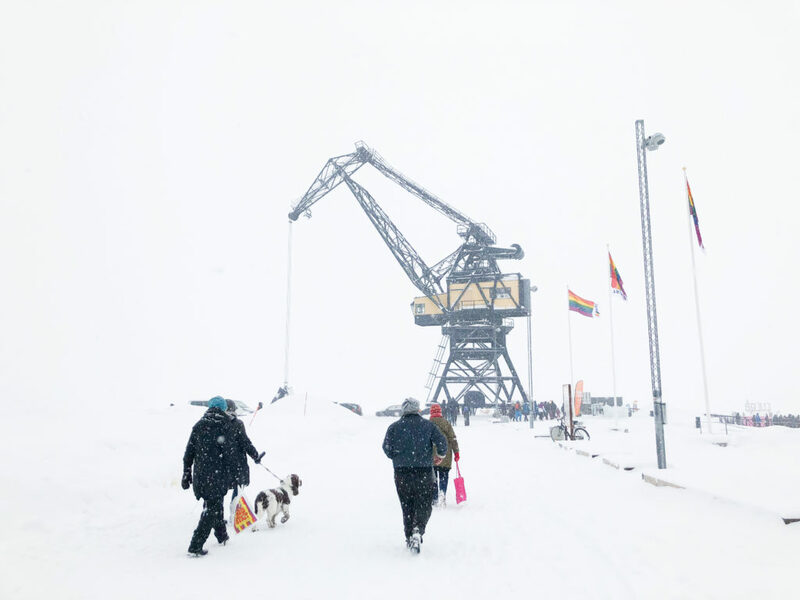 After wading our way through thick new snow out of the parking lot, we made our way towards a large industrial crane situated at the shore’s edge with another pride flag flying high above. Walking down a plank way, we entered a large arena where the main stage and warming tent was held. There were food stalls and small vendors selling tempting warm drinks and merchandise at the entrance. Many were gathered here in brightly colored jackets, scarfs, and hats. 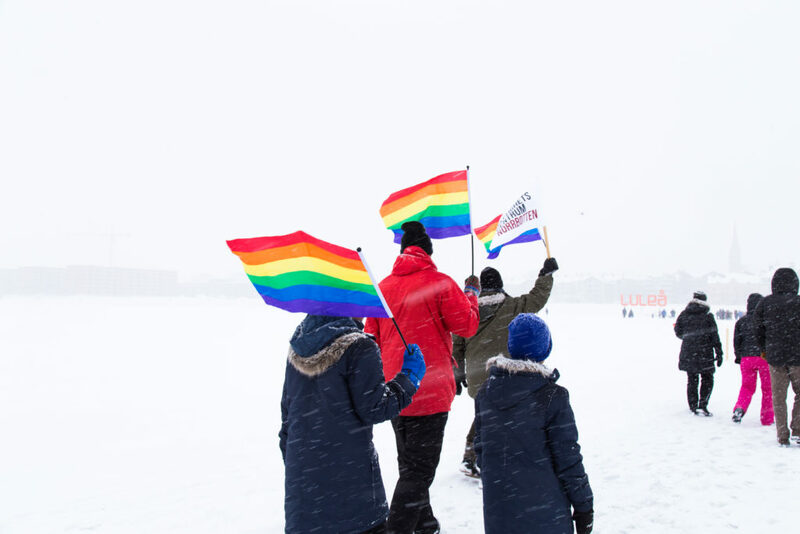 Some even used the pride flags to shelter from the thick snow that was coming down as they listened to the speakers on stage. I learned here that we would be marching half way out to the island of Gråsjälören. We were going to march across the ice and out into the blizzard! At 1pm, the crowd started to make movements out on to the ice. Forming a long train, we processed out into the whiteness, disappearing in the snow falling around us. 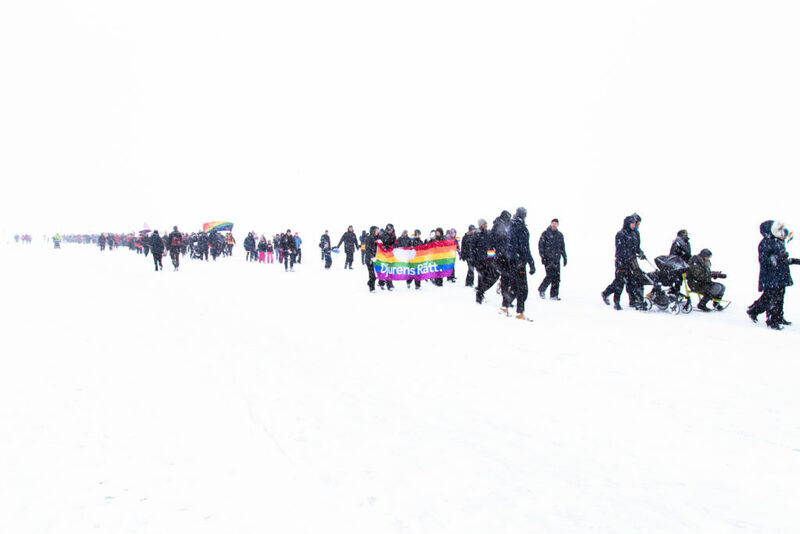 It was magical, seeing such a long parade of people walking together in bright colors out towards the island that was barely visible through the storm. There were young teenagers, older couples, families and their babies; everyone had come out to support the Pride parade. Some skated with skis, some with ice skates, some had sleds, while others, like me, simply walked and enjoyed the otherworldly ambiance of the environment. Wow, probably the most unique pride parade I have ever seen!